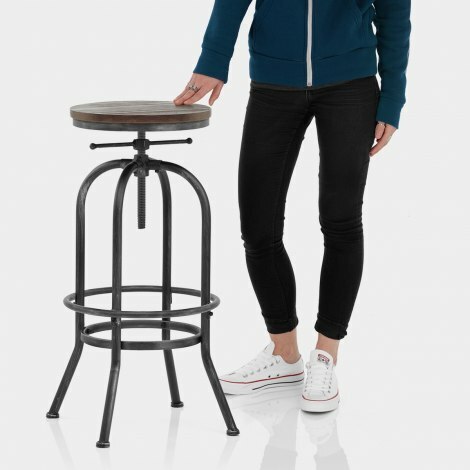 Fusing wood and metal for an authentic warehouse-style look, the High Machinist Stool Gunmetal is certain to be a hit in your interior. The perfect choice for bringing plenty of rustic character to your bar area, this stool is not one to be missed. The round solid wooden seat has a dark wood finish and is held in place by an antiqued gunmetal finished frame. Plus, its backless design occupies less visual space and can be tucked under the bar when necessary. 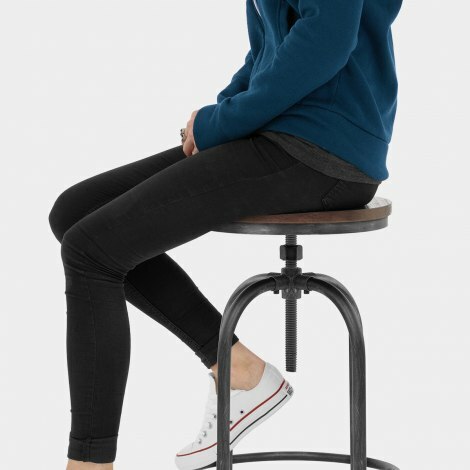 The frame gives this stool its industrial style and has an adjustable height screw thread with 360-degree swivel. Reflecting the seat, round bracing bars connect the legs and form a footrest, enabling stability when seated at all angles. The frame also has a taller design, ideal for higher kitchen worktops and commercial bars, and is complete with adjustable feet and protective floor pads. "Looks good, very solid and secure"
Looks good, very solid and secure, great quality. Better than expected.